Venice, Italy is a delightful cruise ship port of call, and one of the best sail away ports in the world. Venice is located in northeast Italy and much of the city is built on islands or floating piers. Most travelers who visit Venice fall in love with the ambiance and character of this marvelous Italian city. Cruise ships dock on the isle of Venice, and passengers can explore the city using the water taxi system, which is inexpensive and easy to use. These Venice pictures demonstrate how interesting the city can be. Almost all cruise lines that sail the Mediterranean visit Venice, and many overnight in port, allowing passengers the opportunity for a romantic evening gondola ride, an evening drink in St. Mark's Square, or free time to enjoy the city by night. 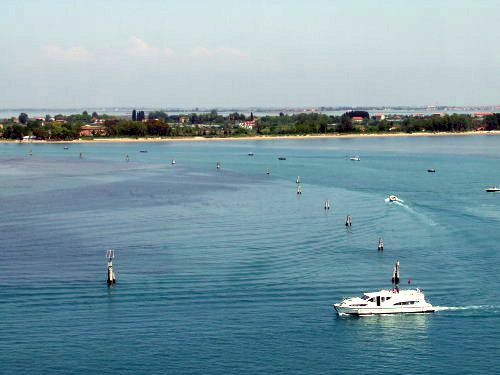 Lido has the beach closest to Venice, and was once prized for its "healthy air". It sits on an island in the southern lagoon of Venice, and is one of the first islands passengers on cruise ships sailing into Venice will see. Lido was one of Europe's most popular resorts in the late 1900s, and the Lido beach is still very popular with Venetians in the summertime. Sailing into Venice on a cruise ship is an amazing event not to be missed. The city is linked to the water, and seeing Venice for the first time from a ship is breathtaking. The Museo Storico Navale is Venice's naval museum, and is located on the San Marco Canal southeast of San Marco. View of St. Mark's Square, Doge's Palace, and the Campanile in Venice, Italy, as seen from the deck of the Carnival Liberty cruise ship. The Santa Maria della Salute Church sits on a peninsula at the end of the Grand Canal in Venice, Italy. The Chiesa dei Gesuati (also known as Santa Maria del Rosario) was built by Dominican friars in 1726. This modern mylar "balloon" animal was definitely out of place in Venice. It was advertising an art exhibit. Kids of all ages seem to be mesmerized by the pigeons in St. Mark's Square in Venice. St. Mark's Square in Venice, Italy - Pigeons Are Everywhere! If you feed the pigeons they will perch all over you. Personally, I kept my distance--being bombarded by pigeons is not my idea of fun. St. Mark's Church (Basilica San Marco) is located in St. Mark's Square (Piazza San Marco). The Byzantine church was built in the 12th century. St. Mark's Basilica is filled with marvelous mosaics of colored tile and gold. The church has a definite Eastern-style, much different than most other Italian cathedrals. The remains of St. Mark have been housed in the church (or its predecsessor on the same site) since the 9th century. The Campanile is a bell tower with an elevator to the top. The Bridge of Sighs used to connect the courtrooms in Doge's Palace to the Venetian prisons. The convicted are said to have "sighed" as they saw Venice for the last time as they crossed the bridge. Harry's Bar was a Hemingway hangout and the home of the Bellini, a drink made with peach juice and white wine. Harry's Bar is just a few steps from the San Marco/Vallaresso vaporetto stop. The bar is touristy, but has a dress code--no shorts. We saw one of the waiters refuse to let two young men who were dressed in shorts into the bar. We enjoyed a very over-priced bellini, just to be able to say we had one at "Harry's". Upstairs from the traditional bar is a very nice restaurant, with great view of the Grand Canal and San Giorgio. La Fenice Opera House was destroyed in a fire in 1996. This fire, and the people of Venice, are the focus of John Berendt's excellent non-fiction book, . I highly recommend this book to anyone planning a cruise to Venice. La Fenice is located on the walk between St. Mark's and the Rialto Bridge in Venice. This easy walk is a good way to see parts of the city away from the main canals and alleyways. The Rialto Bridge crosses the Grand Canal at its narrowest point. The Rialto Market, near the bridge is bustling and interesting. My Italian is not very good, but the pictures told us that this was a horse butcher's shop. The skull statuery on this church was a little Halloween-ish for me! Many visitors to Venice arrive via train. I think a cruise ship is a much better way to enter Venice.